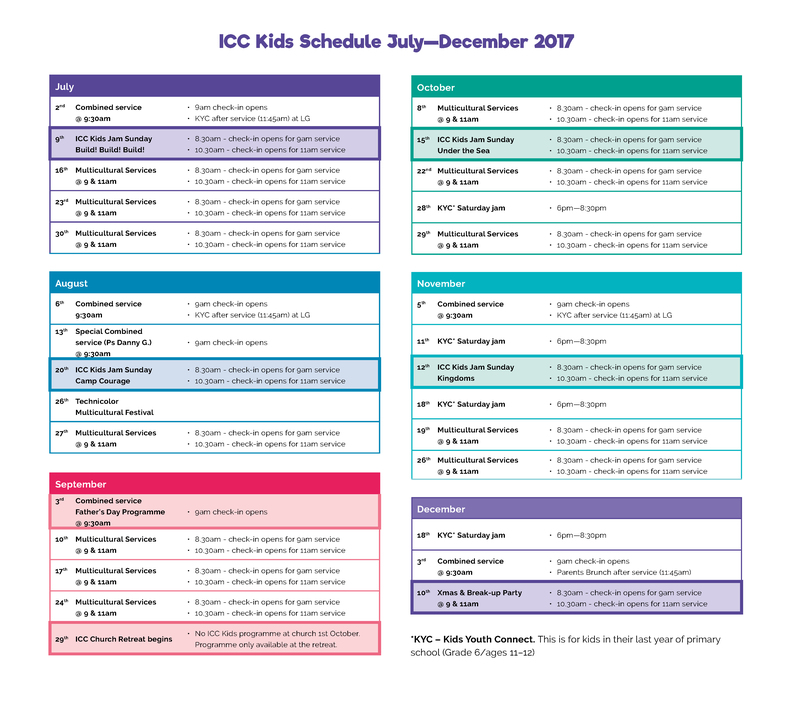 Greetings and welcome to the Children’s ministry at the International City Church – ICC Kids! Seeing children love the Lord Jesus is our passion and we believe that the Children’s Ministry is one of the greatest and most rewarding ministry’s to be involved in. We have a very talented team of teachers who bring individual talents and skills to the ministry. All children’s leaders & assistants have accredited child safety (blue) cards and many are parents who are also working professionals such as doctors, nurses & counselors in healthcare & government services. Here at ICC Kids we believe in partnering with you (parents) to disciple and train your children to be tomorrow’s leaders who will influence and impact the kingdom, families and community. We encourage our parent to do family devotions at home. Each sunday we run THREE seperate exciting programs for the children that cater for children from birth to age 12 – with the aim to teach children to love, obey and serve the Lord Jesus. Due to the growing numbers of children attending our programs, some of our programs are held at Ground and Lower Ground Level (23 Foster St Newmarket QLD 4051). Please contact Alvin or any of our ICC Hosts at the front door who can point you in the right direction. Noah’s Ark 4 – 6 years of age – Children will grow in an atmosphere of fun and creativity. They will begin to express their imagination in skits, stories and songs while beginning to explore and investigate what Jesus taught. J-Club (Jesus Club) 7 – 11 years of age – The program integrates the most up to date and relevant teaching methods and kids sunday school programs that connect and engage children at all learning levels. There is a strong emphasis on Christian values and having an everyday relationship with Jesus. All rooms are equipped with TV’s so parents can watch the sermon. Parents can also request a radio headset to listen to the sermon while moving around the place as they care for their children. Sunday School available 9am – 11am each week. Little Cherubs is a warm and welcoming place where parents can sit and relax with their babies while still being able to watch and listen to a live feed of the sermon. Because of growing numbers we have started using the upstairs classrooms as well as the downstairs rooms where we provide soft comfy lounges, nappy change table and toys for the babies to play. We run a fun program for the kids using videos, activities, songs and games. Occasionally, we provide light refreshments to mums and dads who use the rooms and an assistant on hand to help out with any needs. The nursery is located in the GF overflow area during Service 1 only on Sundays. Just ask one of our friendly ushers at the door for directions. Story time is a when we learn about God’s word. Teachers use a children’s picture book bible to read the story. Children participate in this session either by re-enacting the story (often they dress up in as the Bible characters), using puppets or by placing cut-out characters on a felt board. We also use Christian bible DVD’s and cartoons which the kids love to watch. Our exciting program includes praise & worship time, with modern upbeat style songs We also provide little instruments for little hands to play. The children love this session and are often seen dancing and singing out aloud. Prayer time is when children get a chance to pray for anything that is on their heart. We believe that the prayer of a child is very powerful and therefore we encourage children to pray throughout the program. Craft time follows and reinforces the learning from the Bible story. Children get the chance to paint, draw, use play dough, cook and much more. The program integrates the most up to date and relevant teaching methods that connects and engages children at all learning levels while still ensuring that right Christian values and beliefs are taught. As well as an exciting and interactive program, we also provide Playstation games, Christian computer games (teaching lessons about the Bible), Christian karaoke and other games like twister. Children are especially excited to attend J-Club with these new and exciting activities. J-Club is available for children 9am – 11am on Sundays on the LG Sunday School area. Alternatively you can see the friendly ushers at the front door for more information.